If you prefer to have an invoice sent to you via email, please email me at agillespey@yahoo.com with the quantity of books you want and your contact information.Feel free to send me an email with any questions you might have. A sample of the booklet can be found here. This helps a lot! I took the state qualifier after watching the videos and I got a score of 327. Glad I could help. Good luck at State !!! State TMSCA Champion 5A for the 30th year in a row!!! 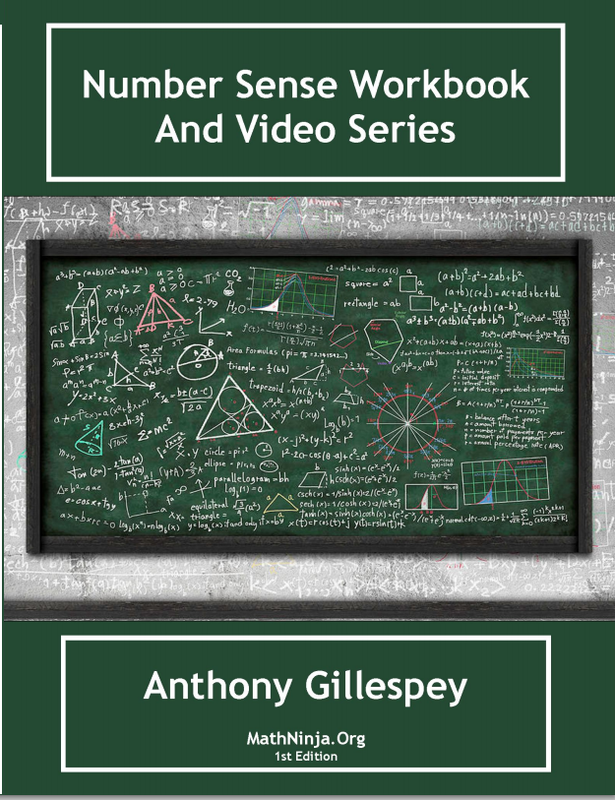 I have learned and enjoyed a lot from your awesome Number Sense Workbook so far. I just wanted to let you know that I found a small error on Page 24. On the top right hand corner of that page, the example says that 23 x 38 = 924. However, 23 x 38 = 874. Thanks for this great book! Hopefully you write a new book, since I really love this one and will get a free copy. Nice catch. I fixed it in the problem but never the snapshot in the corner of the page. Thanks for pointing that out. Someday im going to get around to making a calculator book and Ill send one your way. Thanks for the videos. My score increased from a 187 to a 382. I love this amazing website!!! I got a 397!!! SQUEEEEEEEEEEEEE!!! it’s not possible to get a 397…. Could you please make a video for finding the area of a square with only the diagonal? Hello. I was wondering if there was a nummber sense trick for finding the mean. Can you please tell me if there is? Thank you. You are absolutely right. In fact one question this year on a Number Sense test they in fact reversed the two numbers. Now the question is did the writer of the test do that on purpose? If so then we need to make sure the students understand what form it needs to be set up in to be solved. Thanks for the comment. I am currently watching these videos and my score is increasing. During the school year I was scoring in the 30’s but I started watching these videos 3 days ago and I am currently scoring in the 200’s so Thank You very very much!!! I’m glad to hear it. I have heard a lot of positive comments from you and others. Please share it with your friends and don’t forget to buy the book!!! Today I took a number sense test and I got a 336!!! Thank You!!! Wow that is a great score. Congrats. Thank you for all you’ve done in the number sense area. Your work has helped me greatly. Do you happen to have a trick for multiplying by 1998. I know it shows up on a lot of tests. example : 8 x 1998 = 8 ( 2000-2) = 1600 – 16= 1584 which is all easy math. I purchased one of your books this afternoon, do you know when it will arrive? Ill send it out today. You should get it by Thursday. The best you can do in general is FOIL it. In this specific case I would do (250-4)x 556) which is a variation on the 25’s trick. But that is some hard math to do in your head. I would do it a different way. Since 556 is close to 555, I can “trade” that in for 5/9, and round 247 to 243, which is a multiple of 9 ( I can tell because of the divisibility trick Mr. G put up) and then divide 243 by 9, yielding 27. Then I would multiply 27 by 5, resulting in 135. (BTW, I’ve always found it easier to divide first than multiply first!) Then, I would add back the three zeros I lost when changing 555 to 5/9, yielding 135000, which fits smug in the 5% range of (in this case) 137332. Your book really helped my scores went from a 283 to a 391 in only 1 competition. I hope you are making a calculator book or a science book because i would definitely buy it! I plan on making a calculator one some day. I have learned a lot from your awesome number sense workbook so far, but I found an error in the answer key. The key states that on page 9, the answer to number 13 is 13, but that cannot be true because 75*88 (number 13 on page 9) is 6600. Thanks for this great workbook! Hopefully you will write a new book, since I really like this one. Thanks. I will get fixed. I am going to start working on a second book for Calculator but it takes a lot of time. I purchased one of your number sense workbooks. Do you know when it will come? Put it in the mail this morning. You should have it by Saturday or Monday. Thank you creating such wonderful resources for the number sense tests. My score has tremendously improved over the past year. Thank you once more for the helpful tricks! I would really like to do that but I have never looked into it yet. Before I purchase any of the workbooks, I was curious to find out if these were appropriate for 5th Grade Number Sense. Absolutely, my own daughter is in 5th grade and she is starting on the book. It takes a long time to get good at number sense. The more time the better. The important thing is that they have a firm grasp of multiplication before working with the book. My daughter has joined math club in 5th gr and my son is in 8thgr they love math. I am just surprised why I never got this book before and never knew about this site before. It’s so much fun and exciting and we have great love and respect for all the teachers for their hard work. Thank you so much! As a woman who loves math and science more than anything else it is great pleasure to see there are people like us who respect teachers and knowledge and school, which other people label boring. Thank you for the kind words. I’m glad my site is helping others. Hi Anthony. I’m trying to find a trick for a specific type of question I’ve come across while going through some number sense test. An example is question 61 from the 2007-2008 State Number Sense test. It requires you to directly convert from a non-10 base to another non-10 base. I’ve tried combining the tricks going from a non-10 base to base 10, then base 10 to a non-10 base, but I found it extremely difficult and it took too long, long enough that it’d be faster to skip that problem. Do you have any tricks for this kind of problem? Was it base 2 to 4 or 8. Or maybe base 3 to 9? If there is a trick. Sorry, I thought I’d get an email if I ever got a reply. I showed the problem to a friend and he recommended a trick to me, but never got to teaching me it. They are probably the specific bases tricks you are thinking of. What are the tricks? Does this trick ask about base 2 to 4 or base 2 to 8 or perhaps base 3 to 9? If so they have a fun way to do them. Its quite complicated but I might be able to put a video together of it. change from base something to base 10 then change back to what base you want. YEET I GOT A MEDAL IN CALC!!! !